Our artists can help you design the graphics for the top sheet or base of your custom Donek snowboard. Multiple levels of assistance are available, rates may vary upon complexity. Check out each artists information on this page. Originally from the Dolomite Mountains of Northern Italy, Raffaella Lipscomb has snowboarded her way around the world finally arriving in the stunning BC Mountains. Inspired by nature and formally trained in fine arts, Raffaella uses her Bachelor Degree in animation to beautifully characterize the essence of this region in her art. 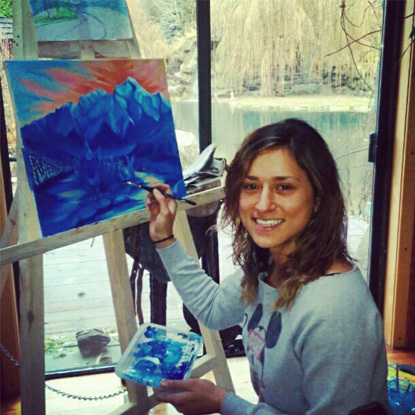 Specializing in illustration, concept art and custom projects, Raffaella is an award winning ski and snowboard graphic artist and is resident custom topsheet artist here at Donek Snowboards. Raffaella has also worked on new technology video games for hospitals, mobile gaming, was lead artist for a children’s book and has designed logos and apparel for various companies. Raffaella is currently working on a children’s book series. Framed in Nature, drawn from Imagination, Comprised of Love.